We can’t survive without bees and bees won’t survive unless we love them. It’s a unique partnership between ‘wild’ creatures and humans: honey bees give us fruit, vegetables, and pastures – we must make sure they have a variety of flowering plants and clean habitats (avoid pesticides, especially neonicotinoids). 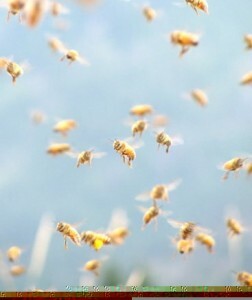 Watch a sweet little film, Dance of the Honey Bee’ (Vimeo). It’s the most important relationship on Earth – everything in Nature depends on pollinators and flowers getting together. Pollination is ‘a love story that feeds the Earth.’ – Louie Schwartzberg. For a flower to make fruit and seeds, its pollen (male) must get to an egg (female), usually in another flower – and bees do 80% of the moving. The result is a cornucopia of foods from cherries to cashews, courgettes to coffee. Our relationship with the pollinators is equally vital so let’s provide bees with a variety of flowers, clean water and spray-free gardens. Why would we want to harm any of these? The EU has put a two year ban on neonics (because of damage to bees)but they are still used in NZ and are available to the public. Let’s ask garden and hardware shops to stop selling them (Placemakers and The Warehouse have recently withdrawn them) and the EPA to ban them. Report: effect of neonicotinoids on beneficial insects. The larval stage of a ladybird (right) loves to eat aphids (left) – great natural pest control. City life can distance people from nature and from the consequences of environmental damage. One solution is to bring nature to people’s door-steps, such as bringing beehives into the city. Murray and Heidi Rixon rent beehives into home gardens. 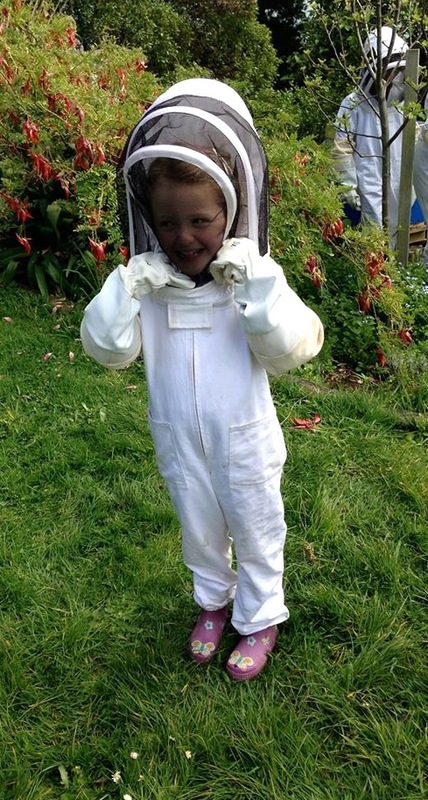 They visit the hives regularly and teach their clients how to manage the bees and provide protective bee suits for the whole family. People can choose their degree of involvement with the hives and most are very keen to learn. They say the Rentahive business has a ”massive feel-good factor” and people are driven by the urge to do something positive and proactive about the bee crisis. Customers are also excited to get a share of the honey. 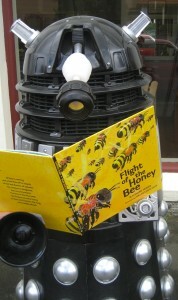 Murray and Heidi have just launched a schools’ project to teach children about bees. The children can partake in beehive construction, help with care of the hive and honey extraction. 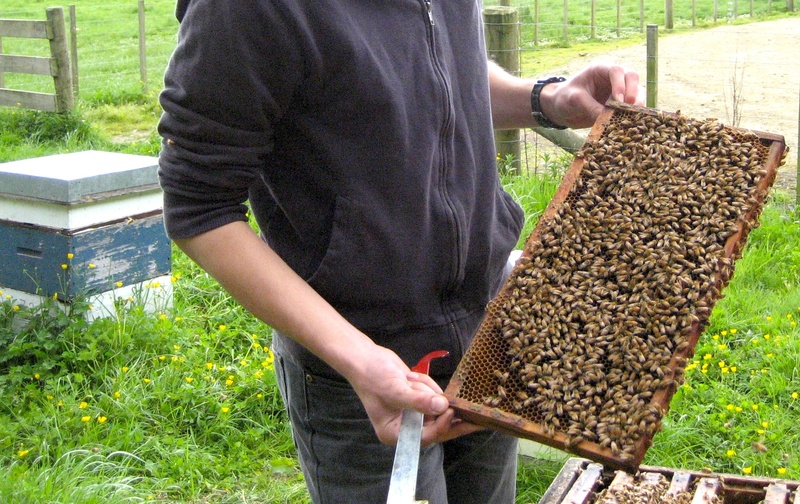 There are many benefits having hives in an urban setting: bees get a longer flowering season and a wider variety of pollen/nectar sources; gardens are well-pollinated; honey flavours are unique; and best of all, people more fully engage with the environment. The latest on the pesticide threat to bees (see Nicotine Bees) is a small victory: a garden supplier has removed the words ‘low toxic to beneficial insects’ from an advertisement for Confidor. This pesticide is extremely toxic to the world’s most beneficial insect, the honey bee. These nicotine-based pesticides are banned in Europe because of links to bee deaths. They stay in the plant right through to flowering – so bees are poisoned by pollen, nectar, dust, and water. Latest research shows how the pesticides contribute to the bee crisis by exposing bees from multiple sources. Photo: Sarah Anderson. Avoid chemicals such as Confidor, Poncho, Advantage, Marathon, Merit and Admire (grotesque names). Grow bee-friendly plants, such as lavender. Let there be weeds; let the broccoli go to seed. Put out clean water in a shallow dish. The home garden supplier, Yates, advertises a handy spray-can of pesticide as ‘low toxic to beneficial insects’ and ‘soft on beneficial insects’. Lies. The pesticide is extremely toxic to the world’s most beneficial insect, the honey bee – a nerve poison 7000 times more lethal than DDT. The pesticide (Confidor) contains nicotine-based poisons which are now banned in France, Italy, Germany, and Slovenia, because of links to massive bee deaths. These nicotine pesticides (‘neonicotinoids’) are widely used on NZ crops and are now available to the public. Labelling them ‘soft’ on pollinators is biting the hand the feeds us. Bees have been our partners for ages– our important foods need bee pollination. Neonicotinoid pesticides are systemic – the whole plant remains toxic right through to flowering. If spray drift doesn’t kill them, bees could be poisoned by pollen, nectar, and drinking water. Even sub-lethal doses weaken bees’ reproduction, immune systems, navigation, and memory. Government agencies are not restricting neonicotinoids, so we all need to act: suppliers can label honestly; garden shops can warn customers; and gardeners can avoid ‘handy’ poisons. Neonicotinoids are in these products: Confidor, Advantage, Merit and Admire (what shameless names). Evidence: Scientific studies/reports; Nicotine Bees (movie); UN Bee Report; EPA Memo; student journalist challenges Yates.